Have you ever gone to a restaurant and wanted to order everything on the menu? As it turns out, restaurants are starting to realize the popularity of sampler dishes since it’s one of the top 10 food trends. If you’re someone who wants to enjoy a little bit of everything, then you need to try eating tapas style meals. If you’re wondering what is a tapa, keep reading to learn all about this genius Spanish creation. If you don’t know what tapas are, they’re the equivalent of American appetizers. The major difference between tapas and appetizers is that you’ll get smaller portions but a lot more variety. Tapas dishes are meant to be shared, so it’s the perfect way to sample a ton of food with your friends. Although the history of tapas is a bit unclear, one strong theory is that this style of eating originated in Spanish bars. In order to draw in more customers, bartenders would serve a little bit of free food with the purchase of each drink. How is giving away free food a good business model? Tapas are profitable for the same reason that American bars set out free snacks like nuts or pretzels. The salt in the food makes people thirsty so they order more drinks! Although tapas menus have evolved over many years across the world, some foods are Spanish staples. If you want to have an authentic tapas experience, look for menus that offer small dishes featuring seafood, Spanish meats such as chorizo, jamon serrano, queso manchego, and assorted vegetables. Some of the most popular tapas dishes to look out for are ceviche, calamares fritos, tortilla Espaola, and gambas al ajillo. Ceviche is raw fish that is chopped into small pieces and tossed in lemon juice and spices. Calamares fritos translates to fried calamari, which is a dish that’s popular around the world. Tortilla Espaola is similar to an omelet that’s filled with potatoes and onion. Gambas al ajillo is sauted garlic shrimp. As you can see, tapas have a nice balance of healthy, fresh ingredients and indulgent dishes. If you go out to eat with friends often, tapas menus make splitting the check simple and fair. Everyone gets to share each dish, which means no one feels left out. Since you can choose from a long list of food, tapas are great for people with different dietary needs. If you’re on a diet, you can eat plenty of delicious grilled seafood and vegetables. If you’re looking for a treat, you can’t go wrong with anything that’s fried. Tapas food is an exciting way to eat your way through Spanish cuisine. Whenever you go out for tapas, don’t forget to complete your experience with plenty of wine to pass around the table. Want to Learn How to Make Your Own Tapas Plate? 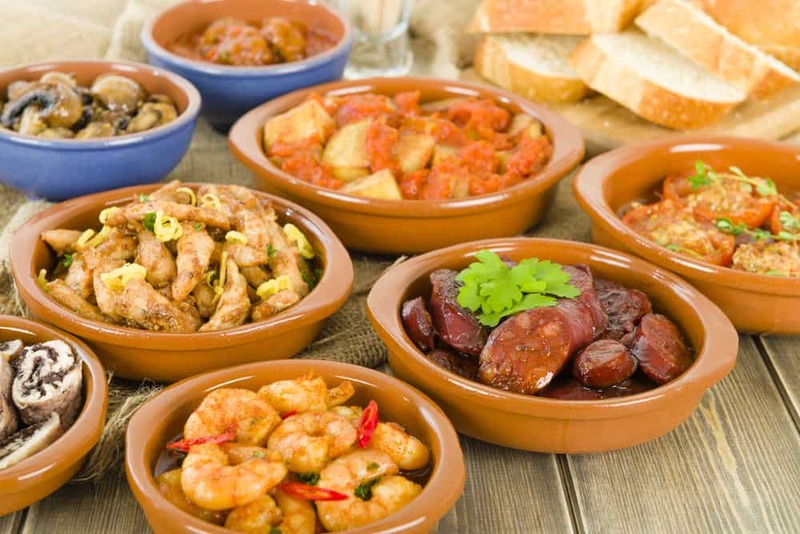 If learning about tapas style eating made you hungry, Amigo Foods has just the fix! Check out our blog for the best authentic Spanish food and recipes. Feeling adventurous? We’ve also got menu inspiration from other Hispanic countries around the globe. Before you know it, you’ll be a master chef.